(West Babylon, N.Y., Feb. 8, 2019) – The Long Island Ducks made their final TD Bank “Take a Duck to Class” visit of the year on Friday morning at Forest Avenue Elementary School. Fifth grade student Dylan Wagner received a special visit from the Ducks Street Team for writing a winning essay in this year’s contest. Jesse surprised Dylan at the school on Friday morning and read the winning essay aloud to the entire fifth grade class. Because he was one of four winners in this year’s competition, Dylan received a host of prizes for his work. Eric Fishon, TD Bank Vice President of U.S. Field Marketing Strategy, and Cara Baldo, TD Bank West Babylon Assistant Vice President/Store Manager, awarded him with a $50 gift card for his efforts. Additionally, the Ducks presented Dylan with a voucher good for five tickets to the team’s Opening Weekend Fireworks game on May 4th, so that he can enjoy a baseball game and fireworks with his family. Also joining in for the fun was Ducks mascot, QuackerJack. After a loud cheer and thunderous applause from the students upon entering the gymnasium, QJ congratulated Dylan on a job well done and thanked Jesse for his service to the community. 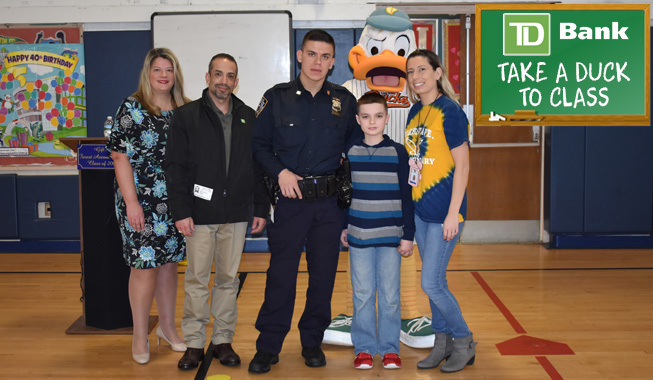 Dylan and Ms. Kuffo even led QuackerJack back to their classroom, where all of the students received special gift bags, courtesy of TD Bank, and a private autograph session with the lovable mascot. TD Bank “Take a Duck to Class” contestants were able fill out applications on LIDucks.com during the fall and submit an essay of 250 words or less on the theme “Who is a hero in your community and why”. Four lucky winners were selected from an entry pool that included thousands of essays. Each winner receives an hour-long visit to their school from QuackerJack and the Ducks as well as a gift card from TD Bank.